I just finished my 2009 Summary/2010 Plans page. I've scrapbooked my summary and objectives for the last three years. I'll post this latest page on Tuesday because I have a tip to share that goes with doing pockets. When you see it, you'll notice that it is a bit busy. I seem to put a lot on these year-end summary pages. 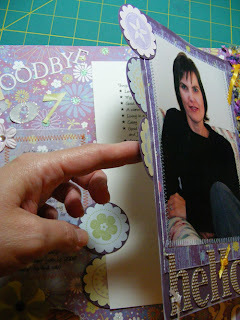 For some reason I usually do Our scrapbook pages as 2 page spreads and the ones for My album as singles. Here is my page from 2007/2008. I said "good riddance" to 2007 for my own personal reasons. Little did I know then what would be happening with the economy and that I should have been more grateful for the full employment I, my friends and family enjoyed. Nevertheless, there were challenges I was glad to overcome. Each section is under a "tab" made from a scalloped circle. Lots of Creative Memories photo tape keeps the pages bound on the right. The thing I enjoy most about this process is writing the "In Addition To" section where I list all kinds of things that weren't really planned but were accomplished anyway. It makes me feel good to see that I really did get a lot of valuable things done. If you ever feel low, pull out a sheet of paper or start a new document in your word processor and start brainstorming all the things you've done outside of your everyday work responsibilities in the last month or year. You'll be amazed. I put a lot of time and resources into these pages. I imagine these to be ones I'll spend a lot of time looking at someday wondering why I obsessed about certain things and what I really did that was important to me and to others. the stamps are Big Flowers from Stampin' Up! The ink is SU! also.